Congratulations to Timothy Wilkens for achieving Victorian Group Training’s apprentice of the month award for April. 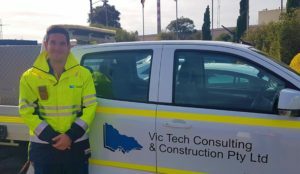 Tim is hosted with Vic Tech Contracting and Construction, and is completing a Certificate III in Electrotechnology. He has just commenced the 4th and final year of his Apprenticeship. Tim is really excelling in his Apprenticeship and really enjoys the challenges that working on large scale projects presents. He really enjoys the Trade school component of his Apprenticeship as well as it reinforces what he learns on the job. Winner receives a $50 gift card.